Any typical form of motor sport is a demanding ask on your car, as you push it to the absolute limits of its designed purpose and beyond, in races that usually last around 10 or 15 laps. But take that one step further and attempt to pound a race circuit for three hours, with only one pit stop, and you are dealing with a whole new level of parameters. No longer are you focusing on making a car as fast as your budget will allow, instead factors like reliability and economy come into play. You will have heard that old saying, ‘to finish first, first you must finish’, well it was undoubtedly an enduro racer who came up with it. For Auckland-based Golden Homes Racing, this is a challenge that has seen its E30 M3 rebuilt from the ground up in preparation for a full assault on the South Island Enduro Series, a four-round championship boasting some pretty serious competition, and a very big prize purse for New Zealand motor sport. The M3 has competed in the series before, firstly running the original 2.3-litre M3 four-cylinder engine, and then a 2.5 six-cylinder before its last guise, a 3.2-litre from an E46 M3 engine that powered them to first place in the 2011 championship. Despite the win, it just wasn't performing as they had hoped, as co-driver and builder Rob explains: “For this rebuild we decided to go back to the four-cylinder and turbocharge it, to get the power we wanted from the 3.2 motor would have made it too unreliable.” The guys were also running an H-pattern gearbox, something very rare within the series that can cost you upwards of half a second a lap versus a car fitted with a sequential box. So they decided to sit last season out and strip the shell bare to start from scratch. The end result is one of the best-prepared and best-presented race cars in New Zealand. To address the reliability issues suffered with the 3.2 E46 M3 engine, the team reverted back to the original 2.3-litre E30 M3 power plant but decided to run boost through it. To stay in class 2 that also meant destroying it to bring the capacity down to 2.0 litres, the maximum allowed with a turbo. But that didn’t mean it would be any type of shrinking violet, as the small-capacity M3 engine now boasts a full list of top-of-the-line parts from brands like CP, Arrow Precision, VAC, and ARP. The head also received a set of custom cams, VAC dual-valve springs, ARP 2000 head studs, a shim under bucket/solid lifter kit, stainless 39mm intake valves, Severe Duty alloy 33mm exhaust valves and titanium valve retainers. The result is a 300kW 2.0-litre that is lighter than the old engine as well as making more power and torque. Sure, the engine specs would allow much more power, but the interesting thing about building an endurance car is factoring in economy. With only a single pit stop in three hours of circulating, and a maximum fuel capacity of 120 litres, the car’s thirst becomes a major limiting factor in its ability to perform. So while the fully built motor would happily take huge amounts of boost and push power figures well beyond the current 300kW at the rear wheels, it would also run out of fuel and never finish a race. While dealing with limiting performance factors, the team went to extreme lengths to improve every other contributing aspect via things like weight, which builder Rob has minimized at every available opportunity. All the glass has been replaced with polycarbonate Lexan and all bolt-on panels were reproduced in carbon fibre or, in the bumpers’ case, with carbon/Kevlar for added strength. With a Peterson dry sump system installed the weight of the amount of hose required would start to add up, especially when wet, and this prompted the team to run Kevlar hose throughout, at considerable cost — it’s around $100 per foot, you do the maths. But it’s the careful consideration of factors like this that slashed the kerb weight a full 300kg over a showroom-spec M3, with the Golden Holmes Racing M3 sitting at 1000kg ready to race. When it came to suspension the team wound the clock back to a time when the E30 M3 was king, and raced throughout the world at the highest levels of tin-top racing in a class known as DTM. Every piece of the suspension apart from the coilovers is either a genuine DTM item sourced from the far reaches of Europe, or if it wasn’t available, recreated here in New Zealand from jigs built from real DTM parts. Even the struts, which have centre-locking hubs, are cast replicas of the real-deal DTM items. Why try to reinvent the wheel, when big-budget factory-backed teams from the late 1980s/early ’90s spent millions developing the chassis — all the hard yards have been done. The only brand-new technology in the suspension are the top-spec Proflec coilovers, and in-cabin adjustable blade-type sway bars. 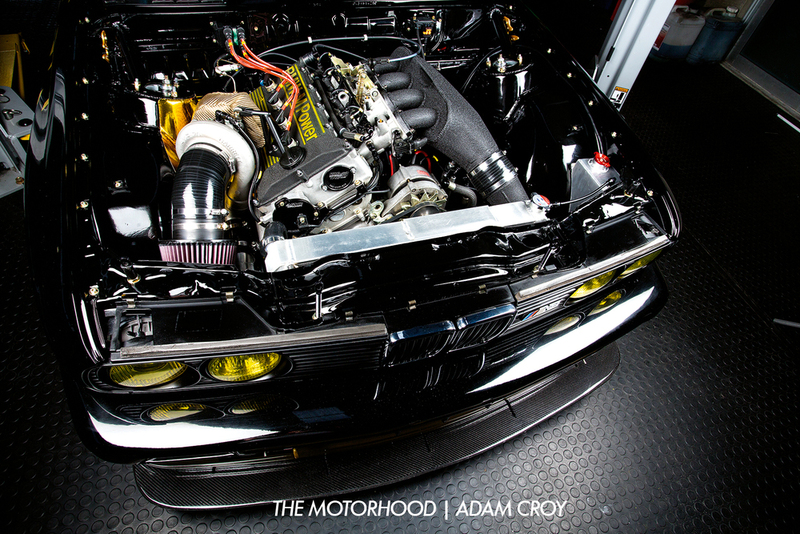 We could sit here all day talking about the technical aspects of the build, but what first grabs anyone’s attention when looking at the M3 is the level of detail built into the chassis. Every part has been hand finished, polished or coated, and even the carbon panels were finished by one of the best car painters in the game. The attention Rob has poured into the chassis over the past year would easily make it a stand-out on the show scene, and it would probably collect a swag of awards. But that is not why it has been built, the team has a job to do, and even constructed a purpose-built enclosed trailer which, as you read this, is heading to Christchurch ready for the opening round of the championship at Teretonga Raceway. It is here that the team will put to the test those years of planning and months of painstaking work. Only time will tell if it’s all paid off, but we will keep you up to date with how their season pans out in coming issues of the magazine.